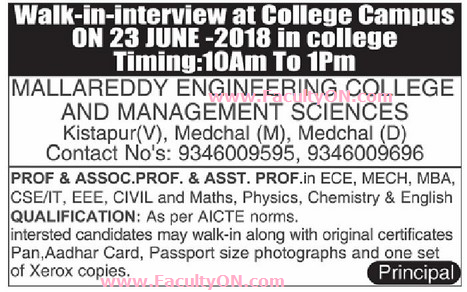 Mallareddy Engineering College and Management Sciences, Ranga Reddy has advertised in the EENADU newspaper for the recruitment of Teaching Faculty- Professor / Associate Professor / Assistant Professor jobs vacancies. Interested and eligible job aspirants are requested to walk-in on 23rd June 2018. Check out further more details below. About College: Malla Reddy Engineering College and Management Sciences, was founded as the premier promoter of quality education in Ranga Reddy district of Telangana in 2008 under VMR Educational SocietySri V. Malla Reddy, as a founder Chairman promoted the educational institute with the mission, to offer the best engineering education with unmatched innovations in the process of teaching and learning by aiming at the all round development of the students. Not only that he wants to take every student through a journey to touch few milestones of the past years to reach academic excellence. How to Apply: Interested and eligible candidates are requested to attend the Walk-in interview along with CV, all originals & photocopies of certificates, PAN card, Aadhaar card and recent passport size photos to the walk-in address given below.